A calendar year is as arbitrary a way to recognize greatness as a numbered list is, especially in an era when so many people see movies in places other than theaters, and in years other than the year of their release. But if nothing else, year-end list-making offers a chance for readers to revisit movies that they might have missed, or reach beyond the box-office champs to find something new for a Netflix queue. Here are 15 of 2014's best—at least according to me. 15. Alan Partridge: Alpha Papa (aka simply Alan Partridge) Steve Coogan returns to his signature role, with the oblivious, self-absorbed titular chat-show host in the middle of a hostage situation at a small-town radio station. It's nothing more than riotously funny work by Coogan, plus blistering writing by The Thick of It/Veep creator Armando Iannucci—and that's enough. 14. Nightcrawler Writer/director Dan Gilroy rides Jake Gyllenhaal's masterful performance as an ambitious crime-scene videographer to craft a terrific allegory not just about journalistic ethics, but about the inherently sociopathic nature of pure capitalism. 13. Edge of Tomorrow I may be in the tank for Doug Liman, but he managed to take a simple, killer sci-fi premise—a soldier (Tom Cruise) caught in a loop of dying and "rebooting" while trying to find a way to defeat an alien invasion—and turn it into a story of how we learn that there may be something in our lives more important than ourselves. 12. They Came Together Genre parodies are a dime a dozen, but is this spin on urban romantic comedies—with Paul Rudd and Amy Poehler as the meet-cute couple—one of the funniest cliché-skewering efforts in years? You can say that again. 11. Selma In the same way that Lincoln was wisely not a cradle-to-grave biopic, but a snapshot of a legendary leader's approach to leadership, Ava DuVernay's study of Martin Luther King's organization of voting-rights protests in Alabama captures something not merely inspirational, but nuts & bolts vital. 10. Listen Up Philip Jason Schwartzman hilariously embodies the self-loathing/self-absorption spin cycle of a moderately successful young writer in writer/director Alex Ross Perry's caustic comedy about "genius" as an excuse for being an a-hole. 9. Mistaken for Strangers It was mistaken for a "The National concert movie," but it's actually a funny, surprisingly emotional portrait of sibling rivalry, as still-living-with-mom would-be-filmmaker Tom Berninger chronicles his time on tour with his brother, The National lead singer Matt Berninger. 8. Only Lovers Left Alive Tilda Swinton and Tom Hiddleston are centuries-old vampires living in the modern world in Jim Jarmusch's dreamy, sometimes hilarious paean to the eternal beauty of art, and how it might give meaning to immortal lives by delivering something new and beautiful. 7. 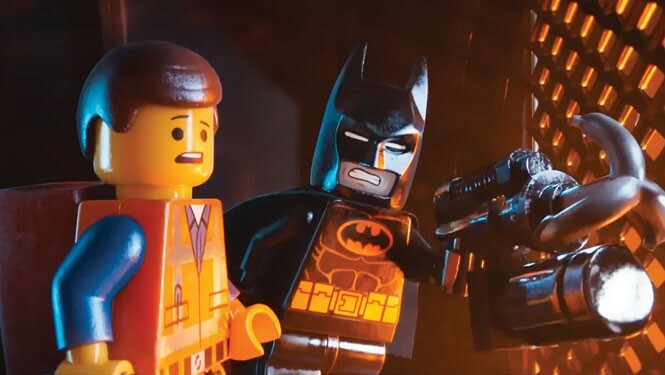 The LEGO Movie If you're going to craft a narrative out of a toy that allows you to turn colorful pieces into nearly anything, this is exactly what you should make. Phil Lord and Christopher Miller manage a smart, wildly imaginative manifesto on how to find the joy in any creative endeavor—even one based on a corporate product. 6. Force Majeure All it takes is one crucial moment during a ski holiday for the marriage of Tomas (Johannes Kuhnke) and Ebba (Lisa Loven Kongsli) to change forever, in Ruben Östlund's darkly satirical portrait of whether we can still live with someone else—or with ourselves—when traditional roles are called into question. 5. We Are the Best! Lukas Moodysson adapts his wife's autobiographical graphic novel about life as an early-'80s punk girl in Stockholm, and the result is an exuberant, wildly entertaining study of adolescent girlhood, anchored by three terrific young performances. 4. Inherent Vice It's a rambling, shambling, shaggy dog of a detective movie, adapted by P.T. Anderson from Thomas Pynchon's novel just the way it should've been adapted. And if you find a finer contemporary example of physical comedy than Joaquin Phoenix's performance as Doc Sportello, please let me know so I can laugh my face off at it. 3. Under the Skin Jonathan Glazer completely upended the source-material novel for this sci-fi tale of a unique predatory visitor (Scarlett Johansson). But his haunting visual style made it one of the year's creepiest, most hypnotic trips, as well as a surprisingly potent exploration of sexual power as seen through inhuman eyes. 2. Two Days, One Night The gut-punching humanism of Belgium's Dardennes brothers continues in this stunning story of a depression-plagued woman (the sublime Marion Cotillard) forced to beg co-workers for a chance to keep her job. It's a potent economic horror story, but just as heartbreaking in its refusal to find an obvious villain. 1. The Babadook Jennifer Kent's stunning debut feature is pitched as a horror movie, and it's true that there's genuinely unsettling stuff in this tale of a single mother haunted by a figure from a pop-up book. But it's also so much deeper and richer than mere genre jolts, with Essie Davis' best-of-the-year performance bringing terrifying immediacy to a single mother's guilt, grief, bone-weary exhaustion and a possibly homicidal inability to cope.